When I photographed my friend Emily's apartment months ago, I recognized her ability to fit into her one communal space, a living room seating arrangement, a workspace and a dining area. After several weeks of envy, I realized that I too could have a cute little dining moment in my one communal room if I shifted a few things around and gave up a few items. I also realized I would have a reason to bring in other pieces that I had long been coveting. When we first looked at the apartment (4 years ago, woah) there was a round dining table for 2, to the right of the living room entryway. Initially, that possibility no longer seemed right after we added the bookshelves along that wall, which cut the depth of the room down about 15". Also, Jack built a large desk in the other space where you would naturally allot for a dining area. Now I can see that the room is still wide enough to accommodate a small table on that wall but near the door still isn't the right place. The only space we can put it is where I've had the leopard chair for the past few years. That chair for your information is about 26"w x 29" long so it's about the size of a 28" - 30" bistro table. Next, I moved the side table that was once beside my couch to the 'dining moment'. The side table is only 26" in diameter, but it gives you a good idea of how a dining moment will fit in that space. I don't think this table is right for a permanent set up but it has given me just enough foresight to know what to look for in a dining table. Which is: 1. something light in color, 2. something more modern to contrast my mostly traditional space, and 3. something no larger than 30" in diameter. I decided to do a little research looking at spaces that were a traditional mix and similar in look to my home, that incorporate round seating moments as well as just round tables within spaces that are not completely dedicated to dining rooms. 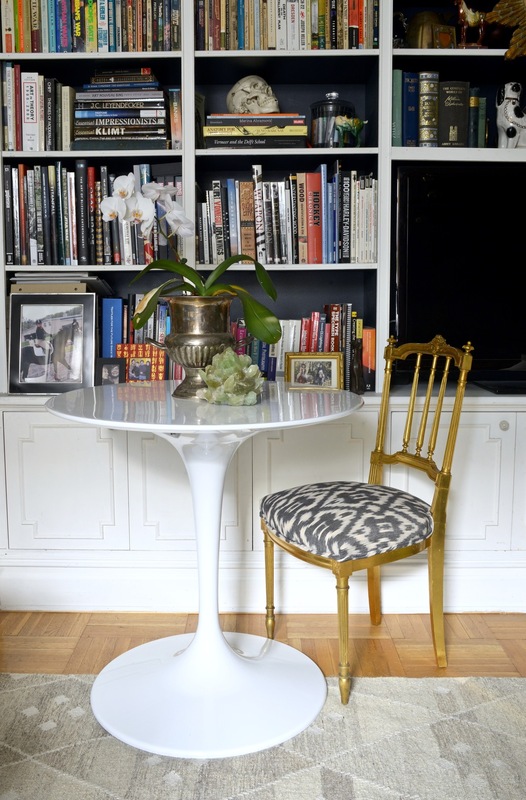 I found I was most drawn to the simple pedestal style bases or the brass wheat tables, so these are the spaces that I focused my attention on. Source unknown... please let me know if you have the source. After looking, I had a better understanding of the direction I'd like to move in. 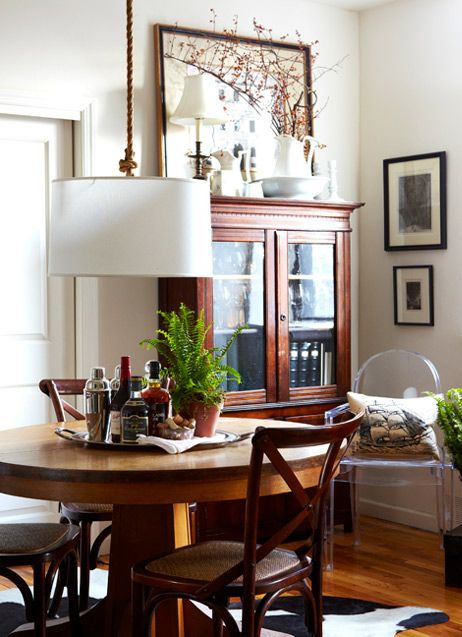 It's the rooms that pair the clean, modern tables with the more traditional chairs. Right now we have a balance of traditional and midcentury and I'm very carefully trying to retain that mix with out it seeming too crazy. In some of the more traditional spaces pictured above, I really enjoy the way the tables have dual use, such as moments for research and inspiration gathering. This is something I will definitely be doing at my table. It's only going to be less than 3 ft. from the desk, an ideal surface to use when splitting my work time between the computer and books. I narrowed my search down to the following three options - keeping in my mind that I didn't want to spend more than $300 on a table. In the end I settled on the Saarinen style tulip table from Lex Mod (for less money here). It's lines are so clean, it's classic, and I love the lacquer - a texture that doesn't compete with the rest of the space. We ordered the table while on vacation hoping to have it when we returned. Which did happen but, unfortunately after opening it I discovered a crack on the finish. Ugh... How many times something like this has happened to me is kind of unbelievable. I feel like the shippers in the Brooklyn area take joys in kicking deliveries off their truck beds or something. Does anyone else run into this? Luckily, Lex Mod replaced the top, free of charge and didn't make us send back the damaged one. Here it is in the space and I have to say it will be a little adjustment getting used to a table being there but I think it will be a wonderful addition to our lifestyle. No more tv tables, an expansion of my workspace, and we can finally invite friends over for intimate dinner parties! CREATE | UNION ADORN - Big News!